Soil SuperMix is a one component mineral-organic fertilizer based on Hydro SuperMix and especially adapted to systems with soil. Nutrients for growing and flowering, and A/B are combined within one product, which makes cultivating very easy. All of the elements mentioned above are 100 % pure and of an organic origin. Therefore this fertilizer is absorbed directly, and a low EC will suffice. Furthermore, the organic components work as a good buffer. 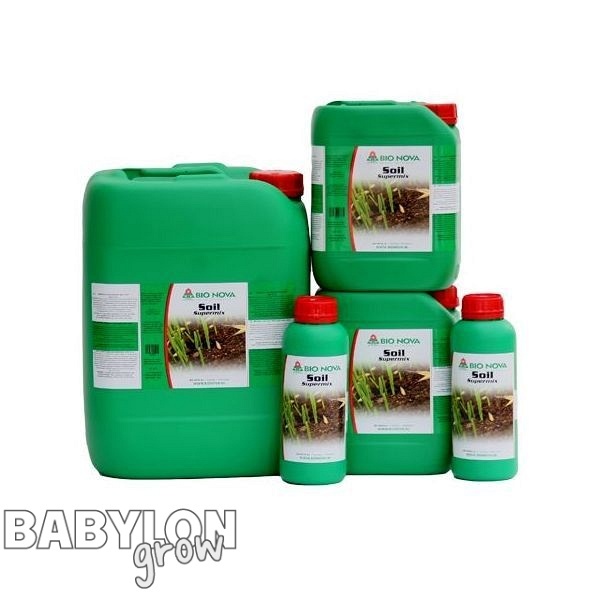 Soil SuperMix enhances an optimal soil condition, actively stimulates the root development and provides as a complete fertilizer not only for growing but also for flowering. Apply a supplement of PK 13-14 as Superbloomer during the flowering period. In spite of the application of chelates (chelated micro elements) which makes this fertilizer virtually pH-independent, it could be necessary to adjust the pH. Use phosphoric acid to adjust the pH downwards. Use potassium-hydroxide solution to adjust the pH upwards. In this case you will need 4 grams of potassium per litre of soil per 0.5 pH. Therefore, the mineral fertilizer Hydro SuperMix is applied as an alternative for dripping systems in order to reach the same result. These minerals are pure and do not clog the dripper. 2-4 times per week 400-500 ml. per 100 litres of water. When you start with richly fertilized soil, you will not need a liquid fertilizer for the first three weeks.